But here I am, going on 19 years of residency in my hometown of Chappaqua—just like a full 55 percent of the community who reside here without children in the School District. One long-time friend returned to the excitement and convenience of the city; saying goodbye was painful for me! Another conversely wishes to slow down, perhaps, and is exploring a warmer climate in a community where taxes are more manageable. Others have opted to stay; still others are on the fence. Like many of my peers who continue to pay New Castle taxes, we are often asked and sometimes even ask ourselves: Why do we stay? Why should we stay? What incentive and resources does New Castle offer its empty nest and more senior resident community? 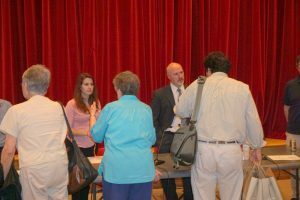 Over the course of an animated 90-minute discussion and exchange of ideas, the nine member panel, led by Town Supervisor Robert Greenstein, addressed questions ranging from whether a tax reduction for residency here beyond the school years is possible to the cultural and educational resources that provide the incentive to stay in the first place. To that end, Greenstein told panel attendees that the Wallace Auditorium at Chappaqua Crossing could be the venue for more Chappaqua Orchestra, theater and dance programs. A new Culture and Arts committee is forming to address the best use of that new town resource. Still, Greenstein offered: “I feel strongly that if you are going to stay here and continue to pay the taxes, then we need to provide activities that make it worth it. Mester agreed that is a good idea and also encouraged those attending to contact the District Clerk for information on how to stay involved with the schools. 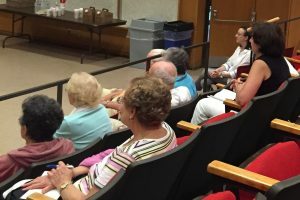 “Participation with seniors is great,” he said, “such as through a pen pal program with fourth graders or simply coming in to discuss your experiences.” One audience member also noted that continuing educational offerings had become predictable and inquired why a language studies teacher at the high school, for example, couldn’t offer a course. Mester noted that it may require allocating funds to pay teachers (who are in contract) to also offer more vibrant continuing education. One common theme that emerged: it’s impossible to pigeon hole empty nesters…their means and their expectations for the town can vary, considerably. For example, not all empty nesters wish to downsize; some will even upsize, as long time Chappaqua residents Bonnie and Gerry Golub did to make their home an inviting place for their children and grandchildren to come visit and stay over. Panelist Bonnie Golub, a real estate agent with William Raveis, is a proponent of a gradual lowering of the tax base to make staying for many residents across the board more attractive too. A tax break notwithstanding, Golub also suggested that the school district actively encourage its students to provide voluntary community service to area seniors. Twenty hours of community service by young people to our seniors before graduation would be a wonderful way to give back, she noted. Panelist and town Social Worker Carolyn Merkin reminded the audience of multiple efforts in New Castle to ease the burden for seniors including home delivered meals programs and volunteers who drive seniors every day whether to and from shopping and doctor appointment or offer help at home for tasks ranging from help paying bills to arranging home care services. Pamela Thornton, director of the Chappaqua Library, and Cassie Ward, director of the New Castle Historical Society (NCHS), were on hand too to summarize the plethora of activities and packed calendars each of these local institutions have available for everyone from toddlers to empty nesters and seniors. (Many in attendance agreed that integrated activities, i.e. those involving many age groups, were highly desirable.) Hundreds of volunteer opportunities are available not only at the Library and the NCHS but at churches and synagogues and not for profits around town; Ward also said that a central data base of all events and programming around town would be extremely helpful. 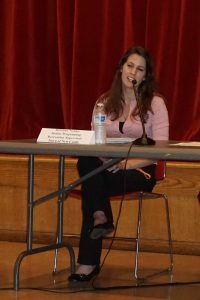 Ronni Diamondstein, a resident of the Chestnut Oak Ridge condominiums in Chappaqua, joined the panel to represent New Castle residents who have never had children in the schools here (nor necessarily plan to). She said she lives here because Chappaqua “is a beautiful town” and that her location at the end of North Greeley Avenue makes walking to the train, going shopping locally and getting involved in a variety of community organizations easy to do. She also mentioned a group (and programming) for empty nesters at Temple Beth El of Northern Westchester. As for me, I’m totally psyched to hear if the new culture/arts committee might bring more adult programming to Chappaqua. I have found condo living (at Old Farm Lake, New Castle’s largest condo community) an absolutely reasonable option for single me with grown kids, and know how fortunate I am given the limits in downsize options. In general, I find the area teeming with work and creative opportunities and possibilities that with just a little more free time, I look forward to exploring more thoroughly. So, for now, and into the foreseeable future, New Castle remains my beloved home. Grace Bennett is Publisher and Editor of The Inside Press: Inside Chappaqua and Inside Armonk Magazines, and most recently produced a guide for the Town called Inside my New Castle: Welcome to our Neighborhood. The following activities are examples of what the Town of New Castle offers our seniors, according to panelist Brittany Nieder, recreation supervisor. Many of the activities take place at the Community House on Senter Street. Thank you for sharing this information. Although I still work full time, I am facing retirement in the near future and I, too, would like to continue to live in Chappaqua. As does Supervisor Greenstein, I live in Old Farm Lake, which I love. However, down the road I know I will be unable to manage the stairs and I wonder if Chappaqua Crossing will have affordable units for seniors? Any news? I think the conversation is great, having raised four children here and lived in Chappaqua for close to 26 years. The library is quite important to me, however, I’ve been unable to use it as much as I’d like as I can rarely get parking! I’ve overheard many people with limited mobility complaining about the same thing and can only hope that the problem will be rectified.